Zocdoc is a popular online appointment scheduling system that is widely used across the healthcare industry. Patients use the platform to discover doctors in their area, read other patient reviews, and to schedule appointments. Since launching in 2007, Zocdoc has become a household name in the healthcare industry. Their innovative platform provides patients with a modern way to search for in-network doctors by insurance provider, book appointments outside of business hours, and read patient reviews, all in one place. Today, many dentists pay the $300 monthly fee to list their practice on Zocdoc. We'll discuss the benefits and caveats of partnering with Zocdoc, to help you determine if it's a good investment for your practice. As an online appointment scheduling system, one of Zocdoc's primary selling points is that it gives patients a convenient way to book appointments on the go, at all hours of the day. If your practice doesn't currently offer a way for patients to book appointments outside of business hours, you could be missing out on a significant segment of the population. Zocdoc reports that 45% of its appointments are booked outside of the practice's business hours. 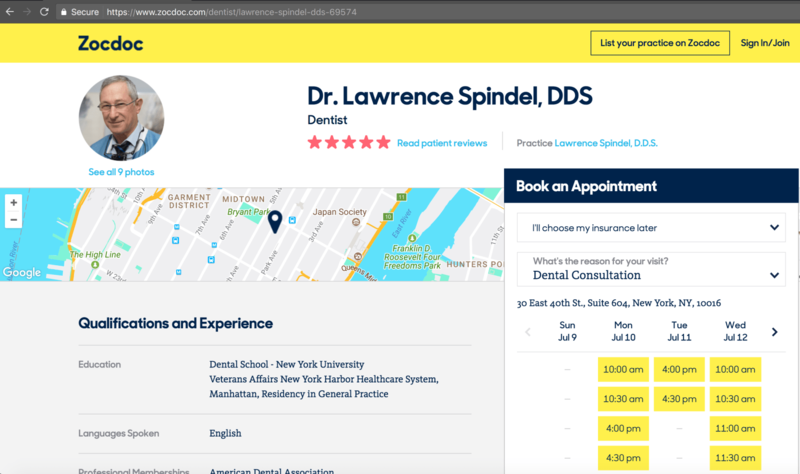 Many practices link to their Zocdoc profile from their website, so that anyone who visits their practice's website can easily book appointments online. To do this, you can simply create a button that says "Book an Appointment", which links patients to your Zocdoc profile. After a patient requests an appointment through your Zocdoc profile, you will need to confirm that the appointment slot is still available, and Zocdoc will take care of sending a final confirmation to the patient. One downside of using Zocdoc is that it can only read your practice management system's availability -- it cannot edit it by adding confirmed appointments. This means that you'll have to add each appointment into your practice management system manually, after you've confirmed it. Zocdoc's ability to pull from your practice management system's live schedule is also helpful when it comes to filling last-minute openings (e.g. due to cancellations). However, it's important to note that some dentists have reported that they dislike the fact that Zocdoc makes it very easy for users to cancel their appointments. If you use Zocdoc, you'll have to be prepared to accept that some percentage of the patients you attract through Zocdoc may cancel their appointments with very little notice. Zocdoc has stated that it will lock a user's account after they've cancelled or rescheduled too many appointments, but other than that, it does not dole out any repercussions or fees to users who cancel or reschedule. All things considered, Zocdoc's online appointment booking capabilities are a great selling point for attracting new patients, filling last-minute openings, and offering patients the ability to book appointments anytime, anywhere. Zocdoc works with a large number of healthcare providers, which means that if you list your practice on Zocdoc, you'll likely have to compete with many other providers in your zip code and specialty. However, Zocdoc also tends to attract loyal patients -- users will usually rebook the same doctor once they have a good experience. According to Zocdoc, 79% of users who rebook an appointment within the same specialty will end up rebooking with the same provider. One potential reason for this high rate of patient loyalty is that Zocdoc users can easily rebook any provider right from their login screen, and access their entire appointment history. Patient reviews are incredibly important -- not only because they provide valuable feedback, but also because they help persuade new patients to book an appointment with you. Listing your practice on Zocdoc can be a great way to increase your number of patient reviews. According to Zocdoc, the average doctor attracts 40 reviews after one year of listing their practice on Zocdoc. To help solicit more patient reviews for you, Zocdoc will email the patient after their appointment has ended, asking "How was your appointment with Dr. ___?" The next time they sign into Zocdoc, the patient will also see a pop-up notification, asking them to leave a review. While it helps to have more reviews under your belt, it helps even more if those reviews are positive ones. One bonus is that Zocdoc users tend to rate their providers favorably -- Zocdoc reports that its doctors earn an average rating of 4.68 out of 5 stars from their patients after one year of using the service. Reviews on your Zocdoc profile are especially powerful since Zocdoc is a reputable reviews site that patients trust. Whereas many patient communication systems will also help solicit patient reviews, these services will typically list the reviews on their own microsite, which generally aren't well-known review sites. So, those reviews are generally carry less weight to prospective patients than Zocdoc patient reviews. Aside from patient reviews, listing your practice on Zocdoc can also help improve your online presence whenever someone searches for a dentist on Google. Zocdoc typically ranks highly in search results, so your Zocdoc profile can be a good source of information that helps potential patients to learn more about your practice. You're in control of what goes into your profile, so you can highlight your strengths and introduce yourself to new patients in a favorable light. Aside from the key benefits listed above, listing your practice on Zocdoc also helps make your staff more productive by helping out with a number of administrative tasks. After a patient has booked an appointment, Zocdoc will email or text them about their appointment (according to the preference they specified), helping to reduce no-shows. Although some practice management systems and patient communication systems help send out appointment reminders, it makes more sense for Zocdoc-sourced patients to get reminders from Zocdoc, rather than from your practice, since that was where they actually booked their appointment in the first place. This also has the benefit of enabling your staff to spend more time on other tasks, rather than having to call, email, or text appointment reminders. Zocdoc also helps facilitate the check-in process for new patients. Patients can fill out paperwork digitally on Zocdoc before they even step foot in your office. This helps save your staff time, and also improves your patients' experience by giving them a convenient way to fill out their paperwork at home. How does Zocdoc compare to other online scheduling systems? Zocdoc is the most well-known online scheduling system on the market. Though it's an excellent option for virtually any dental practice, there are a few other options for dental practices to consider, depending on what functionality you're looking for, and what tradeoffs you're willing to make. Whereas Zocdoc is marketed toward the entire healthcare industry, LocalMed is designed specifically for dentists. On the appointment scheduling side, LocalMed offers more robust scheduling capabilities, since it's able to read and write to your practice management system. This saves your staff from having to manually enter confirmed appointments into your PMS's schedule. Whereas Zocdoc includes reviews on your practice's profile, LocalMed doesn't show or solicit any patient reviews -- it just displays practice information and hours. Zocdoc is also a more well-known platform for patients to discover healthcare providers, so more patients will likely discover your practice through Zocdoc's website than through LocalMed's site. However, LocalMed has strategic partnerships with United Concordia and Healthgrades, which can also help provide additional exposure for practices who use LocalMed. In terms of price, Zocdoc costs $300/month with a year-long contract, as opposed to LocalMed, which costs $249/month without any long-term commitment. Limelight is an add-on module that is available to Solutionreach users for an additional $80/month, in addition to Solutionreach's $379/month base price. The module cannot be purchased as a standalone product. Limelight and Zocdoc offer comparable scheduling functionality. Both systems are able to read from your practice management system, so patients will be able to see your practice's available appointment slots, and request only appointment times that are available. Both systems also require you to confirm appointments, and manually enter them into your practice management system. However, since Zocdoc is a more well-known website than Limelight, patients will typically trust Zocdoc more than Limelight. In addition, we find that Zocdoc's user interface is more user-friendly for patients. Though Solutionreach helps practices solicit patient reviews, these reviews are hosted on a different website than your Limelight profile. This means that when patients visit your Limelight page, they won't be able to see your patient reviews. In contrast, when patients schedule appointments through your Zocdoc profile, they will also be able to see patient reviews right on the same page. If your practice currently uses Solutionreach, then Limelight is a viable alternative to Zocdoc if you're looking to save some money. However, many practices also use Solutionreach and Zocdoc together, to take advantage of Solutionreach's excellent patient communication features, and Zocdoc's scheduling & marketing capabilities. Though Demandforce is a popular automated patient communication system, it claims to offer online scheduling capabilities as part of its base price. However, its scheduling capabilities aren't as robust as Zocdoc's. On your practice's Demandforce site, your schedule isn't synced with your practice management software's schedule -- patients can request any time in between your practice's business hours. This makes it likely that a patient will request a time slot that is unavailable, which will require your staff to call them to select an alternative time. This additional overhead negates a lot of the benefits that online appointment scheduling offers, and is essentially the same as asking the patient to email your practice in order to schedule an appointment. For this reason, even if you're a Demandforce user, Zocdoc is an excellent choice for practices who want to reap the benefits of online appointment scheduling. However, Demandforce is currently testing a new scheduling system, which should bring its scheduling capabilities up to par with Zocdoc. The new scheduling system will sync with your PMS and will only display available appointment slots, according to your practice management software's schedule. This functionality is only available to select practices right now, but will eventually become available for all Demandforce users, and will be included in Demandforce's $299/month base price.